I can always tell when a technician was trained by an “old-timer” like me. How? They “spank” or slap the glass into position rather than smooth it in place to make the seal. It comes from the old days when glass had to be spanked and seated into a gasket or when dense butyl tape needed to be forced down to contact uneven pinchwelds. Liquid urethanes call for smoothing the seal, not spanking or slapping the glass into place. First, let me say it’s not necessarily wrong to slap the glass. It is, rather, ill-advised. There are two negative results that can happen when a glass is slapped rather than smoothed. If the glass is thin, chipped or scratched, then the chance of premature breakage is increased. If the glass is “hot,” the glass is more volatile and can fracture. Some of these issues can and should be caught by the technician prior to installing. However, how hard is too hard to slap the glass into place? It only takes one break to lose your profit and possibly a customer to inconvenience. 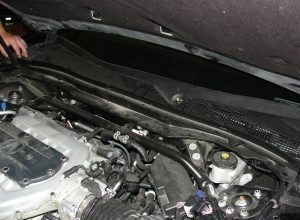 The second negative issue involves leaking and bonding. Curved glass has a spring to it. It can be depressed as much as a couple of inches before breakage and then sprung back to its original shape or curvature. If the bead of urethane is short and the glass is slapped at its apex, it can make contact and then “string out,” causing leaks and bonding problems. 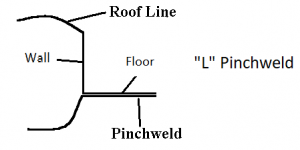 If it is smoothed-out, the urethane bead is redistributed into weak areas, making for a more solid bond and leak-free installation. If I said I never spanked or slapped the glass, I would be a liar. There are instances where a slight slap is necessary. 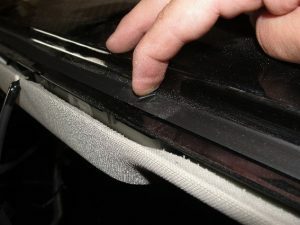 If you have a large, tall or awkward vehicle where leveraged pressure can’t be applied to the edge of the glass, such as in large service vans, then a slight tap on the top and bottom center may be called for. Of course, this is after a careful inspection of the glass part conducted during the prep stage and that the glass is not exposed to excessive heat. My advice is to use slapping only when you must and only when the glass was carefully inspected for pre-installation damage. Keep the glass out of bright hot sunlight for as long as possible prior to installation into the opening. Reduce the violence used in past installations as much as you can. 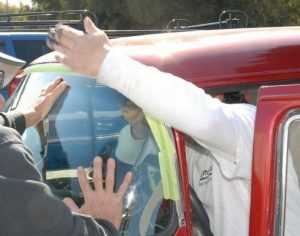 The customer will feel less anxious if watching the process and vehicle and glass damage will be reduced to increase profits. I belong to several glass related technicians’ groups on Facebook and enjoy participating in discussions when I can. This past week a conversation brought back memories of my installer past and the old DW837/836 windshield. I thought I would share it with my readers this week. 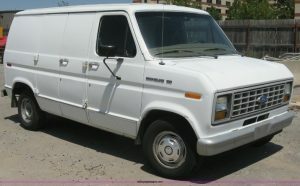 The DW837/836 windshield is the windshield for a 1975-1991 Ford full-sized van. Back in the day, we used to do a LOT of them. That was our service vehicle when I was an installer. It has four-sided heavy chrome mouldings and a block size of 34×73, which makes it a large and awkward piece of glass to set by yourself. The original equipment adhesive was butyl tape. When I did these windshields, we used round butyl to replace them. I would smear some liquid butyl on the passenger side bottom pinchweld and apply the butyl tape to the glass. Then, I set the glass onto the liquid butyl, slid it to the far pinchweld, set it in place, decked it and then back sealed the seam with a flow-grade sealant. This was a successful method because we rarely had a leak or noise complaint. The two types of butyl meshed together and sealed permanently. 8.4 Whenever OEM retention systems are modified on later production models without body style modification, the most current retention system shall be used in the replacement unless otherwise specified by the OEM. However, the Ford van never had a change to urethane until the body style changed in 1992. Thus, the OEM specifies butyl for a Ford Van of that body style so by rights, butyl could be used. 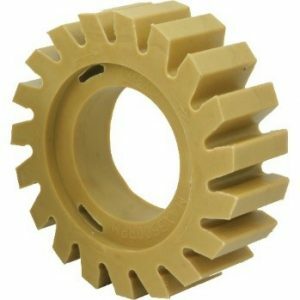 Today our industry recommends the use of urethane when replacing these parts, rather than continuing to use inferior bonding adhesives. This is to ensure the bonding is improved and not hindered and so the replacement must be done correctly. Use a sharpened plastic stick to scrape off the remainder of the tape. Use a big ball of old butyl to stick to the remaining butyl and peal it off. Use a solvent for removal. This would require an additional process to neutralize the solvent. In any case, it’s time consuming and difficult to accomplish. In a past posting I suggested the use of a tool used by collision centers to remove decals and pinstriping, called an eraser. 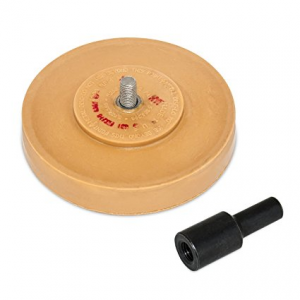 It’s a rubber wheel inserted into a drill and used as a butyl eraser; it works well. It literally erases the butyl like pencil markings from paper without damage to the paint. 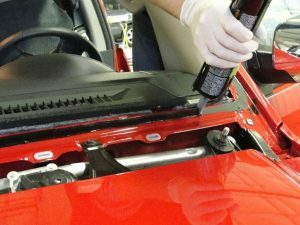 The tech then dusts the pinchweld of rubberized residue, primes the pinchweld, applies the urethane to the proper height and width and sets the glass using the modern setting tools or a helper. This method of butyl removal is fast, easy, economical and damage free. If you give it a try you won’t be sorry.